Babies grow in the blink of a eye! It seems like yesterday that I was shopping for pregnancy clothes and now I’m putting away the bouncy seat and selling the 0-3 month clothes. Just yesterday, I needed to decide whether to buy size 2 or 3 diapers. Where does the time go? I don’t want to forget products that are absolute necessity so I try to stay on top of things by planning ahead. Since travel is as important as food and water in our lives, and Athena spends hours in the van happily playing with her toys and looking in the mirror, we figured that it’s never too early to think about a larger car seat. Britax is always busy working on new products with innovative safety, comfort, and ease-of-use features to meet the needs of both parents and children, making them the perfect choice for a car seat for Athena. We’re cheap when it comes to clothing and novelties, but when it comes to safety, we want the best. After countless hours of research, we decided that it doesn’t get any better than the Frontier 85! At the forefront in harness design, impact protection, and comfort, the Frontier 85 will be enjoyed by Athena for hours of travel and adventure. Traveling in a vehicle can be stressful for new parents and children. Even if you are driving carefully and following all of the road rules, accidents still happen. The True Side Impact Protection of the Frontier 85 offers a head restraint creating an extra layer of energy-absorbing foam, keeping the head, neck and spine “in true” or aligned. The deep side walls are lined with energy-absorbing foam to distribute crash forces. They shield from vehicle intrusion and contain the head, neck, and body. The Energy-Absorbing Versa-Tether features a staged-release tether webbing to slow the forward movement, reducing the crash forces, and the two-point attachment minimizes forward rotation while anchoring the top of the seat. 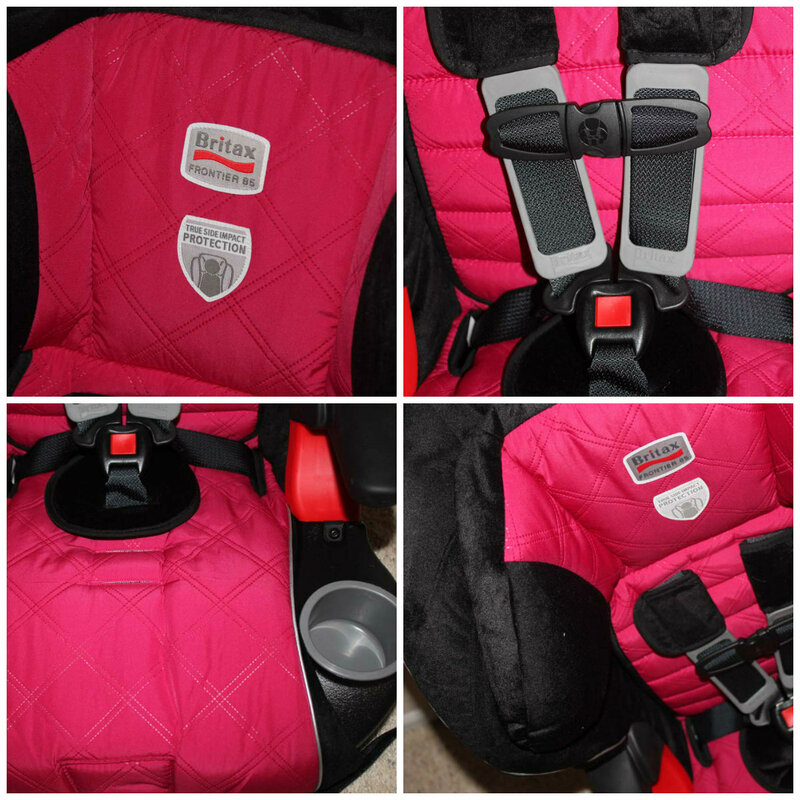 The reality is that I am going to worry about crashes and other vehicles and everything else in Athena’s life; it’s part of being a parent, but knowing that she is riding in a highly-rated, protective seat brings some comfort to my car travels. The Frontier 85 has the most versatile Five-Point Harness system. 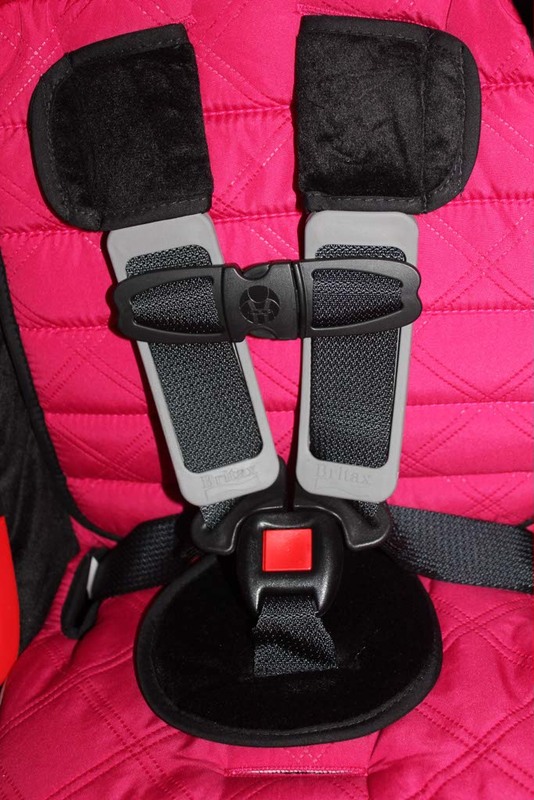 With the highest Five-Point Harness seat capacity, children can remain harnessed up to 85lbs. The Quick-Adjust, No-Rethread Harness repositions the harness shoulder height without disassembling the harness straps, and with 10 harness height positions and three buckle positions, it’s guaranteed to provide a comfortable, secure fit. The Harness-2-Booster even converts to a belt-positioning booster seat. During long drives, we try to stop regularly and allow Athena to stretch often, but the comfort of a car seat is extremely important. We’ve already experienced slight neck problems as she prefers to tilt her head to the right. It was a concern for us and we considered eliminating car travel altogether until she was completely comfortable with resting her head in a straight line position. We now use a neck rest and do regular stretches with her, but as she grows, we want to continue watching her neck muscle development. The High Density Comfort Foam of the Frontier 85 provides an extra layer of padding and the Plush, Premium Cover is set with thick, underlying comfort foam to provide extra comfort and encourage proper positioning. With the proper support, like what the Frontier 85 offers, regular rest stops, and continued neck therapy exercises, we can still travel often. I may love extreme sports and adventures, but when it comes to driving on the highway with my daughter in the vehicle, my cautious, nervous side is in control. There is nothing more important than Athena and I want to protect her as much as possible. I know I can always count on Britax to make a high quality product with safety in mind. Check out this great link to read about the Booster Evaluations for 2011. Britax Frontier 85 leads the way! This entry was posted in Pregnancy, Pregnant, Product Reviews, Reviews and tagged Babies, Baby, Baby Product Reviews, Baby Products, bucket list, Bucket List Publications, car seat, Family, Lesley Carter, travel, Travel blog, travel magazine by lesleycarter. Bookmark the permalink. I know this wasn’t the main point of the article, but I love that you named your baby Athena! She’s going to be a strong, adventurous girl and she’s beautiful! Haha that’s the truth! And you’ve provided some very helpful tips for traveling with a tot. I’m nowhere near that point in my life yet but I hope you’re still writing for us when that time comes around! When I read this, I was wondering why she was talking about my dog…her name is Athena too 😉 It’s a fabulous name!! I can’t say enough wonderful things about this. Both of my girls are in them and love them. Roomy and not constrictive like previous other brands we’ve had. They are fairly affordable too and worth the buy! what I mean), other than the peace of mind! Thank you for doing the research for me! I am sold! Btw Athena is a DOLL!!!!! Let me know how it works out for you and I’ll include your comment, along with a link to your blog, on this page. What a beautiful baby! I don’t think we can easily buy Britax here in Japan, which is a shame. That harness looks like one of the safest I’ve seen. Thank you for stopping by my blog the other day and liking my play dough post, appreciate it! Britax are great and Athena is Adorable! Now that I’m a granddaddy, I can attest to the need for the car seat. I used it quite a lot the past several weeks taking Baby Maddie around in my car visiting relatives. Nice article. Great name and great choice of car seat, my daughter loves her and is almost excited to get into in. A complete 360 from my son who used a Peg. Great write up. Thanks for the likes! Athena is beautiful! The car seat debate usually rages for several months here when the littles shift to bigger seats. 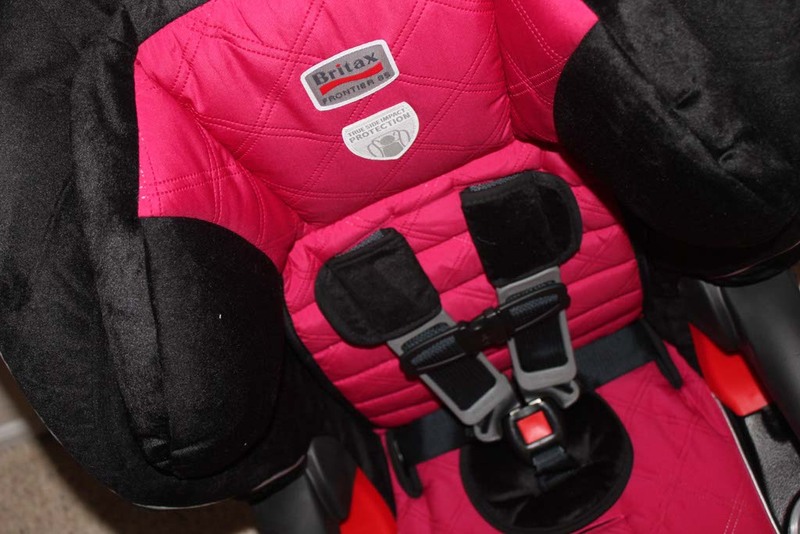 We really like our Britax seats…even if they are worth more than the vehicle. 😉 She looks very comfortable! She’s so precious! What a little adventurer. Thank you for this. I went and viewed the company’s website. I will keep them in mind for my next child. Darling baby,Lesley, but then, why SHOULDN’T she be , with you as a mom??? My dear, if you think the time goes fast now, hang onto your hat! My youth went too fast, my kids grew up so fast, but I han hardly leave the room on my grandkids…the years fly by.Enjoy every minute! Have you looked into the Graco My ride 65? I bought two of them for the girls when they turned one and just bought another one for the baby. They are amazing, and very comfortable. They have a a lot of room and the kids can actually lay back a little if they want to because its sunked in the back. Its has all the best safety products as well, and that was one of my things also. Safety and comfort. But I know what you mean, traveling with little ones, it gets tough and you always worry wondering if they are okay and if their necks are ok.
You put your money where it counts. Good for you! This post came at just the right time for us, thanks for the info. I left you a gift in my latest blog post. I hope that you love it! Hi, I’m new here. 🙂 First, I love your daughter’s name! Also, she’s completely adorable. 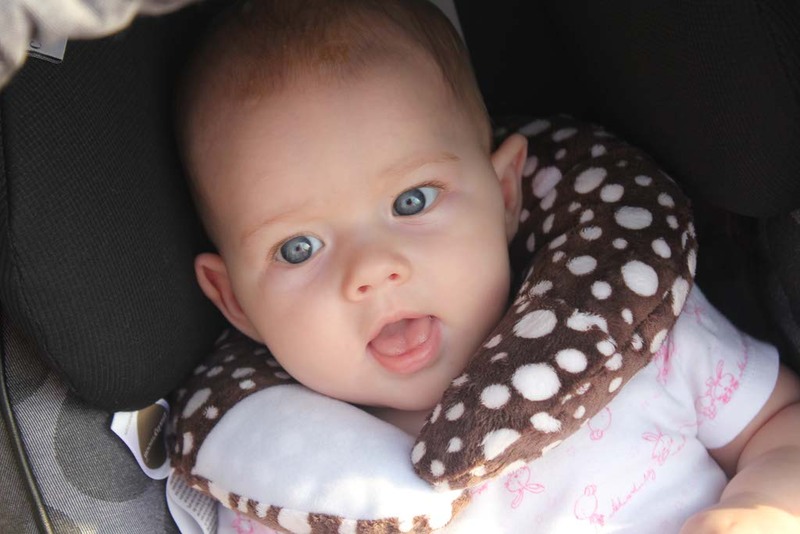 My 5-year-old daughter has used a Britax car seat since she outgrew her infant seat and we love it. We’ve been lucky to never have been in an accident, but it does seem very secure and comfortable. As for Athena’s tendency to tilt her head to the right, you might want to ask your pediatrician if she has torticollis (sp?) if you haven’t already done so. My 15-month old son had it as an infant (favored the left side). Usually nothing too major – just some exercises are needed to strengthen the muscles.